Dunfermline High Street recently saw a street promotion with a difference when SNP activists and Peruvian musicians joined forces for an impromptu musical session. 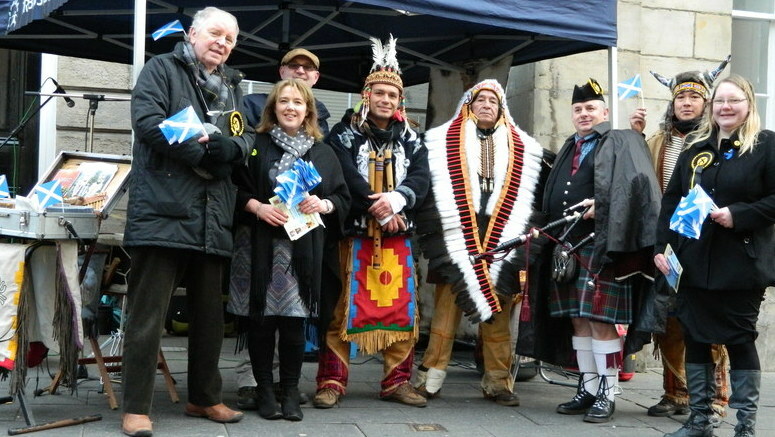 The SNP group, including local MSP Bill Walker and Dunfermline North council candidate Fay Sinclair, were holding their regular Saturday morning session at the Mercat Cross—while Tribus Del Sol, a World Music band based in Edinburgh, were performing further along the High Street. Tunes such as “Highland Cathedral” took on a new twist when performed with panpipes rather than bagpipes, as Tribus del Sol and SNP piper Brian Kelly took turn about to perform. Mr Walker said: “It was great to meet Tribus Del Sol and listen to their wonderful music. We all had a really enjoyable time on Saturday. “The musicians were all dressed in traditional native South American outfits, and when they added saltires to their regalia it gave the occasion a very international flavour! Tribus del Sol, whose name is Spanish for “Tribes of the Sun”, are touring Scotland, England and Ireland. They are part of a cultural non-profit organisation formed in Peru in 2006 and comprise two woodwind players, a drummer and a charango (Peruvian stringed instrument) player.